In 2016, a total of 40.4 million t of goods crossed the Swiss Alps, which marks a new record and corresponds to an increase of 3.7% compared to the year before. The main driver behind the increase in freight volumes is the relatively strong performance of the European economy, which also leads to a high level of foreign trade activities. The majority of transalpine freight is carried by rail, which continues to grow, compared to road transport. The trend is also confirmed by a recent study published by the Swiss Governmental Department for the Environment, Traffic, Energy and Communication (UVEK). With initiatives driven by the European Union, member states as well as Switzerland the cargo shift from road to rail is progressing. The freight volume carried by rail has been steadily increasing since 2013, and in 2016 the share of rail freight amounted to 71% of the entire cargo crossing the Alps. With a total of 28.7 million t in that year, rail freight transport in Switzerland even managed to outperform the all-time peak of 2015. This corresponds to a plus of 6.4%, which is 1.7 million t in absolute numbers. 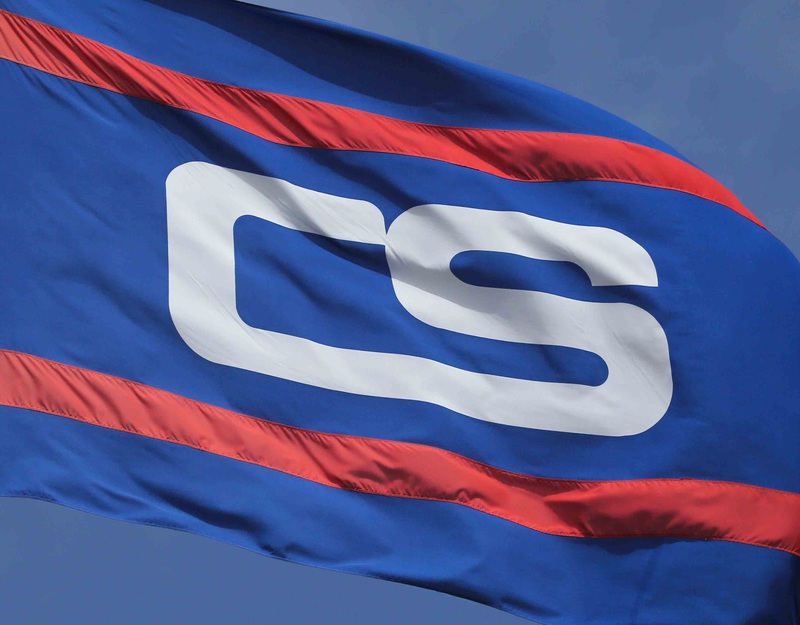 For integrated service providers such as Contship’s Hannibal, this record does not come as a surprise. Hannibal connects over 25 intermodal round trips per week via its rail hub Milano to international destinations in Switzerland, Germany, Hungary and the Netherlands as well as numerous connections within Italy and has been experiencing an increase in demand for a considerable amount of time. With freight traffic picking up, the volume of cargo transiting the Alps on the roads decreased further in 2016 in comparison to 2015. In total there were 975,000 trips, which is 35,000 trips less than in 2015 and corresponds to a decline of 3.4%. This development marks another remarkable result, as for the first time since 1994 the number of trips amounted to less than one million per year. Thus, one of the goals of the Swiss government’s act to shift cargo crossing the Alps from road to rail (Güterverkehrsverlagerungsgesetz/GVVG) has been reached, although admittedly five years later than initially planned. For 2018, another ambitious goal is in place, which sets the limit of the number of trips during the entire year to a maximum of 650,000. The key drivers behind the development of transalpine traffic are both the economic situations in Switzerland’s neighboring countries as well as foreign trade activities of these states. Italy is of particular significance in this context, as the authors of the study cite. A large part of the traffic crossing the Swiss Alps is export from or import to Italy. To the North, Germany is the most important source as well as country of destination for Swiss cargo. 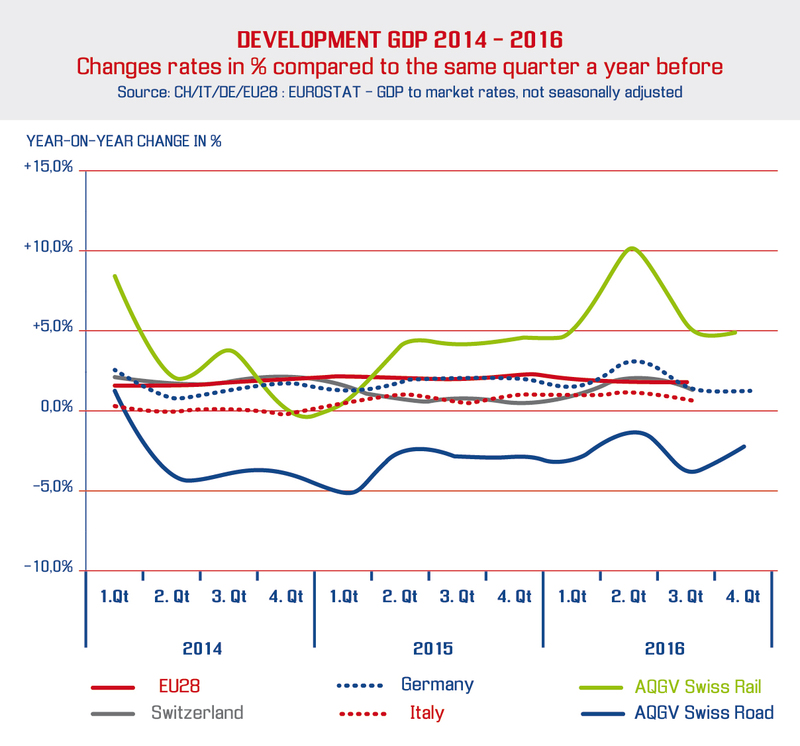 The link between the economic situation in Switzerland, Italy and Germany and the volume of transalpine freight traffic becomes clear when looking at the development of the gross domestic products in these countries. The gross domestic product of Switzerland stagnated in 2015 but recovered in 2016. The Italian gross domestic product rose moderately but steadily during the first three quarters of 2016 and recorded a plus of 1% year-on-year (expected to reach 1.4% increase in 2017). The German GDP increased by 1.6% during the first three quarters of 2016, which is in line with the development in the European Union. Correspondingly, the volume of transalpine freight traffic picked up in 2016 as well. Looking at the development of foreign trade activities and the volume of Swiss transalpine traffic, the link between the two factor becomes obvious, too. Both foreign trade activities and the volume of rail freight developed discontinuously between 2014 and 2016. The authors of the study explain that the development of the volume (in t) of transalpine cargo in Switzerland followed the development of foreign trade activities in Germany and Switzerland but especially in Italy, even though slightly delayed. Italy recorded less foreign trade activities during the second half of 2014, but demonstrated an upswing during 2015. However, this weakened during the first half of 2016 and the third quarter of 2016 even saw less foreign trade activities in Italy than in 2015. 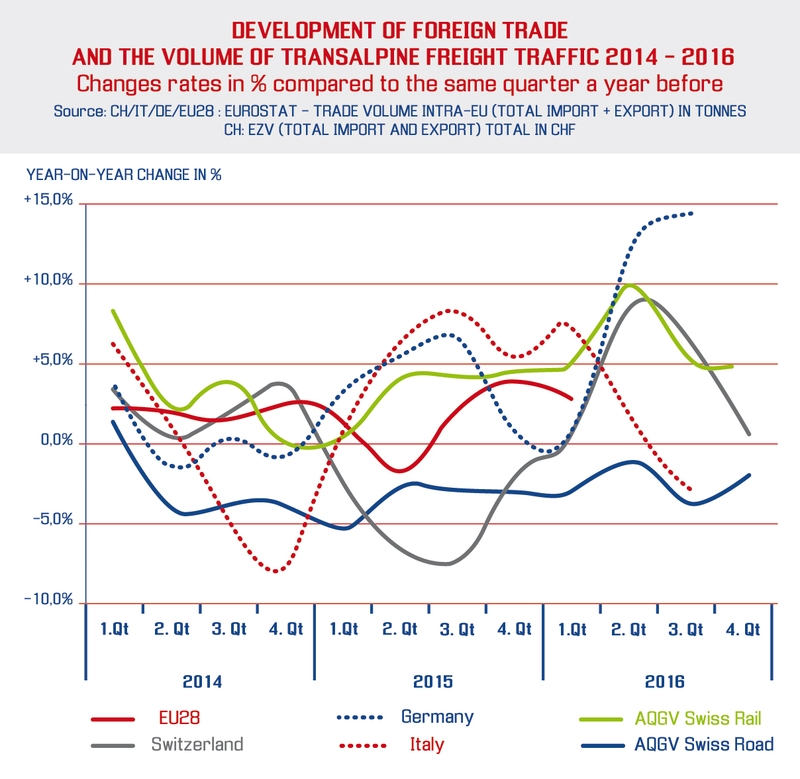 Regarding transalpine freight volume, this led to a recovery in 2016, although it remains to be seen if the downward development in Italy is being reflected at a later stage as well. In terms of the general development, all signs point towards rail freight increasing in volume even further in the near future. This is partly because analysts are expecting the European economy for both member countries of the EU as well as Switzerland to further expand within the next two years. However, another crucial factor is heavy investments by Alpine countries to improve rail infrastructure. Italy for example last year increased its budget to modernize its rail network and ultimately shift more freight traffic from road to rail to a total of EUR 17 billion. The country aims to transport 30% of its freight by train in 2020 and is improving the four TEN-T Corridors that run between the mountain passes to the southern ports to support this goal. Of these links, the one via the Gotthard Tunnel through Switzerland is the most important Rhine-Alpine Corridor. Between Rotterdam and Genoa it runs through a strong economic area that accounts for 16% of the European Union’s GDP. Switzerland is investing heavily to support smoother cargo flows as well. With the new 15-kilomtere-long Ceneri Base Tunnel, which is due to be operational in late 2020, this crucial artery for North-South freight traffic will lead to freight trains to be able to transport up to 2,000 tonnes instead of the roughly 1,600 tonnes they can move today. This development will certainly benefit the entire region. However, Italy’s maritime and transport industry, in particular, is likely to experience a quantum leap. Improved connections will advance further the Italian ports’ significance as gateways for cargoes traveling the global supply chain, offering a viable alternative for both import and export cargo for countries such as Italy, Germany and Benelux.